A tradition that is easy for collectors to get on board with, the 2018 Topps Baseball Silver Pack program provides exclusive cards in exchange for flagship hobby box purchases. Similar to the 2017 promo, the free packs apply to 2018 Topps Series 1 and Series 2, plus Update Series is included for the first time. The focus of the promo set is 1983 Topps, with a chromium design in honor of the 35th anniversary of the release. The base design borrows that classic '83 look, adding a stamp for the anniversary and an exclusive chain pattern that many call "Mojo." In addition to a base set, there are limited parallels and autographs to seek out in 2018 Topps Baseball Silver Pack. 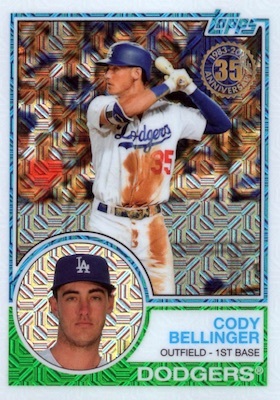 Base parallels include Blue Refractor (#/150), Green Refractor (#/99), Purple Refractor (#/75), Gold Refractor (#/50), Orange Refractor (#/25), Red Refractor (#/5) and Superfractor (1/1). 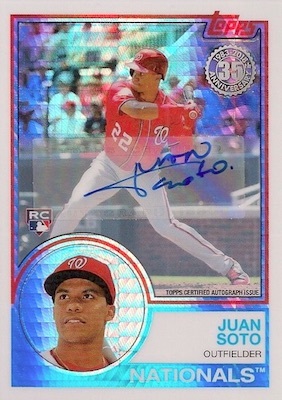 As far as autographs, Orange Refractor (#/25), Red Refractor (#/5) and Superfractor (1/1) versions are available. Found in hobby stores and via online stores, collectors only need to purchase a hobby or jumbo hobby box to earn the exclusive packs. It is still good to verify before you buy to confirm the 2018 Topps Baseball Silver Pack promotion is applied to your order. As in past years, one pack is awarded for each hobby box, while jumbo boxes yield two packs. 2018 Topps Series 1 **119 CARD "SILVER PACK CHROME LOT" ** ..Numbers Below. 150 cards. Shop on eBay. REFRACTOR PARALLELS: Blue #/150, Green #/99, Purple/Blue Wave #/75, Gold #/50, Orange #/25, Red #/5, Superfractor 1/1. 100 cards. Known print runs listed. Shop on eBay. *Only parallels seen for cards noted. * Let us know if you spot any base print runs. 2018 Topps Autograph 1983 Chrome Nicky Delmonico Rc #12 Serial #123 199!!! Super nice cards and a great bonus for buying boxes!!! Nice break on a hobby box. Silver packs are essential. One shop told me they only had them for “pre order” customers and i wound up going somewhere else where i pulled a nice silver pack. Ok i pulled an Alex Bregman blue refractor #/150 from the Series 2 excluive packs. I cannot find it anywhere. Any ideas on the price or where I can look for it. I see that some people are calling it silver packs while they are actually called exclusive packs so im confused. Can’t someone please help me? I have recently recieved a 1/1 2018 series 2 topps chrome Gary Sanchez . It is a good looking mojo 1/1 . Can anyone tell me what this would be worth . It is Mint. My email is golec80@netzero.com. if you can help me I’d greatly appreciate it. Yeah, Series 2 is just standard Chrome rather than the Mojo pattern. No clue why they made the switch as the unique background made them stand out. The 2018/1983 redux is fantastic overall. 1983 Topps is my all-time favorite card. I was 10 that year. I’ve been buying the update series sliver packs on eBay. I’ve also purchased a lot of Series 1 & 2 sliver packs. So far best hit is Freddie Freeman auto #8/30. And I’m a Braves fan. There is only one thing I will never understand about the 2018 series is why they did not make a Tony Gwynn 1983 redux. They did tons of older stars but not Gwynn. Gwynn was the cornerstone of 1983 Topps. I pulled one from a pack back in the 80’s. I now own three. TOPPS 2018 SEALED BASEBALL SERIES 1 JUMBO HOBBY BOX (INCLUDES 2 SILVER PACKS)!!! TOPPS 2018 SEALED BASEBALL SERIES 1 REGULAR HOBBY BOX (INCLUDES 1 SILVER PACK)! !